This blouse was made by Senora Ana Bautista Delacruz in Ixcacuatitla, a village in the remote Huasteca region of Veracruz. The Huasteca style is a cheerful profusion of colour and large, vibrant blossoms are offset by exquisitely intricate geometric motifs. Using cross stitch, the artisans create the designs from memory as they have been learned by heart and count out each individual stitch without using a pattern. The Gallery of Folk Art supports traditional crafts by running prestigious competitions and this blouse won first place! At the age of 7 Nicolas was sent into the jungle to find a rare yellow spider web which would make him successful and talented at whatever he endeavoured to do once it was spun into a bracelet. He chose embroidery and is now considered a master of his craft which he teaches to the young Totonac women at the ‘House of Cotton’ in the Centre of Indigenous Arts in Papantla. High above the clouds in the Sierras of Hidalgo a style of embroidery began in the Otomi village of San Nicolas when Dona Otilia Cruz was inspired by the zoomorphic motifs found in ancient cave paintings nearby. She brought Ezequiel to show him and teach him the techniques and his creative flair became famous so much so that he was commissioned by Hermes to design a limited edition of their renowned scarves. 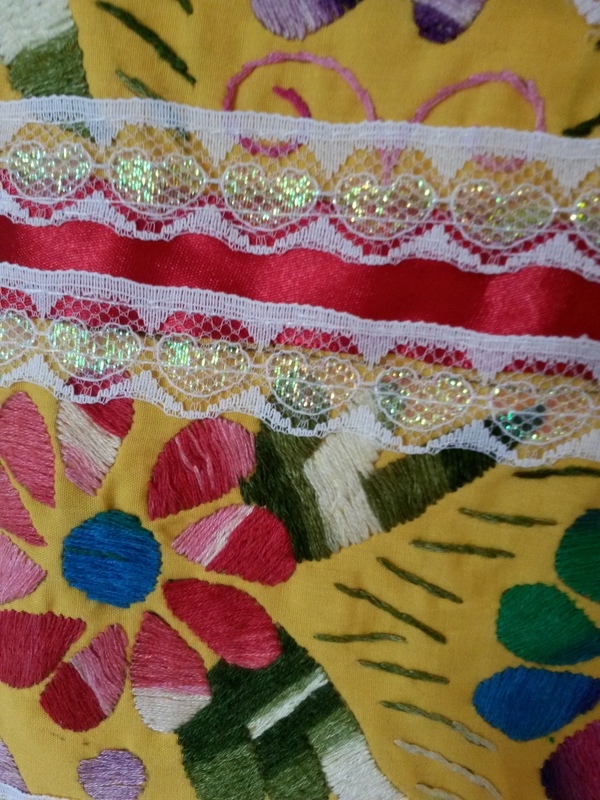 Senora Francisca was taught embroidery by her mother and grandmother when she was 7 and now the designs and patterns are embedded in her memory. We spent two wonderful afternoons together as she patiently answered my incessant questions about her embroidery and told me of Bishop Vasco de Quiroga, a champion of indigenous people and their crafts in 16th century Michoacan. She laughed as she retrieved a dusty old box from beneath her workbench that was filled with countless certificates, newspaper articles and photos of prize-winning ceremonies but was beaming when I purchased this rebozo which had taken 8 months to complete in the colours and patterns of her ancestors and had won first place in the Dia de la Candeleria Craft Competition. Tsintsuntsan, the home of the humming-bird, was once the seat of the Purepecha Empire and it is here that the tradition of women embroidering ‘Historias’ or stories of daily life for their daughters originated. It is continued in nearby Santa Maria today on the shores of the Patzcuaro Lake and as Senora Roselia embroidered beside her daughter I poured over the tableaus depicting the everyday activities of fishing, making tortillas and harvesting corn as well as celebrations such as weddings, Day of the Dead and Dance of the Old Men. The Mazahue people are renowned for the intricacies of their embroideries as they only use one thread to complete the complicated geometric and zoomorphic patterns. On close inspection they are exquisitely detailed and as I marveled at their perfection Jan assured me that there was a mistake to be found in each embroidery. As imperceptible as the error may be it is crucial to include for the Mazahue people as an offer and acknowledgement to God, as only God is perfect. ‘All I wanted to do was chase butterflies’, remembers Senora Antonina, of her childhood spent helping her mother embroider. Antonina and her four sisters had been taught embroidery and crochet from the age of 5, which they did every morning before school and at bedtime, and she often woke up with a jolt from a forgotten crochet hook! Her mothers’ fame stretched as far as the US and Europe and she was able to buy each daughter a house with the proceeds from her embroidery. Antonina is now a recognized Grandmaster of Craft in Oaxaca and her colourful embroidered blouses feature beautiful pansies, roses and hummingbirds surrounded by foliage. There is even the occasional butterfly dancing through the patterns. ‘They say we are like Peacocks’, laughed Senora Teresa of the formidable Zapoteca women from the Tehuentepec Isthmus, because we have gorgeous ribboned hairstyles, glittering gold filigree jewellery, breathtakingingly embroidered traditional costumes and walk barefoot! Influenced by Spanish Mantillas, Arabic goldthread work and Chinese silk embroidery introduced during Colonial times, their gala costumes were made famous by Frida Kahlo. Today they are worn with pride by the young women explained Teresa as her granddaughter modelled their traditional head-dresses for us. Teresa is also a recognized Grandmaster of Craft in Oaxaca and her work is in great demand as each gala costume takes at least 6 months to complete. The mission of the Casa de las Artesenias de Oaxaca is to maintain, support and promote their culture, traditions and crafts. There are 50 members of the co-operative which has been running for 14 years and each member donates one day to the shop allowing them to spend the rest of their time in their studios. Whilst speaking to their current director, Fidel Salazar he was passionate about the importance of their work and their next aim which is to establish the co-operative as an educational centre. Senora Dorothea is from San Vicente Coatlan, a Zapotec village in Oaxaca and although we had trouble communicating as Spanish is her second language and mine has much room for improvement, it was clear to see the pride she has in her work. She was keen to show me the ‘Haz-me si puedes’, detail on the blouse I purchased as it translates to, ‘Make me if you can’, a challenge if ever I saw one as the technique involves gathering the fabric, stitch by stitch and then embroidering a running block motif on top of the new surface! The magnificent ‘Baile de Pina’ or ‘Dance of the Pineapple’ is performed by the women of Tuxtepec at the spectacular Guelaguetza, an annual celebration in Oaxaca that gives thanks to the gods through music, dance and offerings. At the end of their performance, the women of Tuxtepec hurl pineapples into the delighted audience! This childs’ costume was purchased from Veronica Salazar, a member of the Lantecera studio of men and women from her family. The Encuentro Artesanal is an outstanding showcase of the range of crafts produced in Oaxaca and is held each year in conjunction with the Gueleguetza as over 150 stalls are set-up in various locations throughout the city with the support of the Oaxacan institute of Craftspeople (ARIPO). Efijena Garcia had travelled from the village of Santa Maria Zacatepec, where the Tacuate men are famous for their embroidered costumes that feature tiny, ‘animalitos’. Senora Cecilia laughed as she told the story of how the costume of Chiapa De Corzo was inspired by a caravan of travelling performers from Spain who dazzled the people of the village in the 18th century, she shrugged because at that time there was a melting pot of cultures in Mexico with the Trade Routes bringing influences from far flung places, so who knows where it originated. 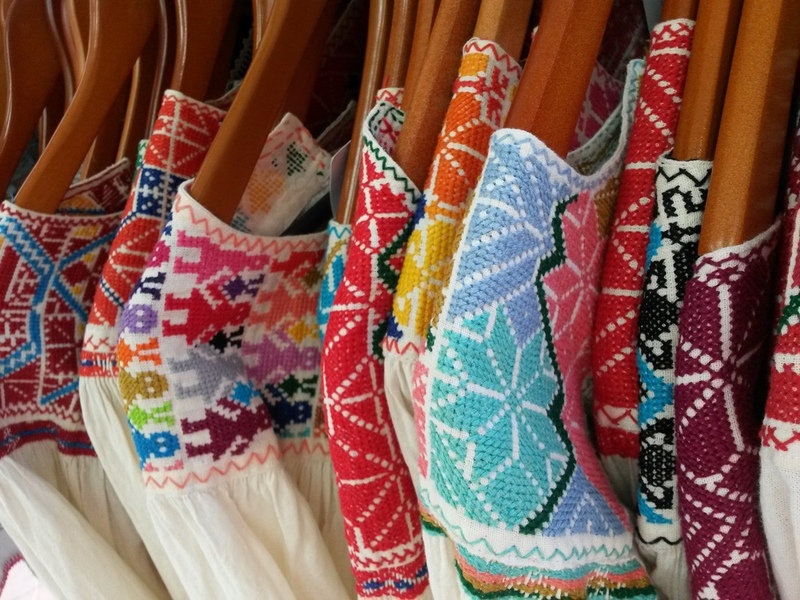 Both the costume and the technique of embroidering the pattern upside-down are unique to Chiapa de Corzo and the garments made by Cecilia in Matohue are considered to be the best. As I approached Dona Marias house I saw her sitting in the grass outside, legs tucked under, a waist-loom attached and surrounded by balls of wool. She continued her weaving as we chatted, with her family who were spinning yarn beside us kindly helping to translate as she spoke little Spanish. Maria is famous for establishing a women’s co-operative in San Juan Chamula and the surrounding Tzotzil municipalities despite strong resistance from the community. She described the processes they ue to spin, dye and weave as well as the traditional costume of the people. This little waistcoat was worn by boys and her son laughed as he remembered wearing his on the way to school during the cold winter months. The Tzeltal women from Aguacatenango guard the ancient tradition of embroidering their native costumes closely. As a result of this they do not sell them commercially, but rather a simplified version is available for tourists. I met Senora Andrea who works at Sna Jojobil, an excellent textile co-operative beside the outstanding Textile Museum of the Mayan World. I admired her beautiful blouse which she had made in the traditional techniques, motifs and colours of Aguacatenango and she told me how annoyed she was when she had almost completed the original blouse, tried it on and found that it didn’t fit on the sleeves. I couldn’t believe my luck when she kindly agreed to let me purchase the original one. In the Sierras of Puebla the weather is so cold that the Nahuatl women wear woolen quechquemitl or ponchos. These and their traditional blusas are embroidered with woolen yarn that is dyed with natural plants, fruits and insects so as not to harm the delicate balance in their environment. The motifs come from The Tree of Life, an important feature of the Nahuatl cosmovision and the geometric borders signify the journey of life. Senora Beatriz is a member of the Sitaltsin Women’s Co-operative and she emphasized the importance of embroidery amongst the women in expressing their emotions, particularly love, but sometimes sorrow and loss aswell. Senora Yolanda and her neighbours Elia and Estella were the last artisans I met on my journey in the dusty village of San Gabriel Chilac that is famous for its’ beaded blouses. When Yolanda invited me into her house she seemed mystified as to why I was interested in the embroideries but showed me her grandmothers’ samplers and demonstrated the incredibly intricate technique of adding the beads one-by-one by catching two individual threads with the needle. The designs were a profusion of flowers, birds, animals and characters completely rendered in beads. Yolanda lamented the demise of a tradition and craft that her village was once famous for as young women no longer wear the traditional costumes and at festivals they borrow their grandmothers’ blouses. No-one is learning the technique today.